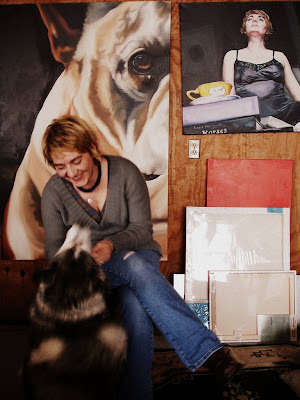 Stray Dog Arts: I have a little self portrait side-project that's been filling me with inspiration. Wanna take a peek? I have a little self portrait side-project that's been filling me with inspiration. Wanna take a peek? my wolfie girl, anu, and i shared a joy-filled moment in the studio together after playing in the snow. my dogs bring unexpected amounts of happiness into my life and today was no exception. welcome to a moment in my love-filled life. love fills all of our lives--the trick is simply in noticing it.